I’ve not written much about coming back to Red Hat to head up the Open Innovation Labs in EMEA, but somehow it seemed fitting to author a blog post to mark a momentous last week. Last week we held the official opening events for Red Hat’s Open Innovation Labs space in London and on Tuesday of this week our first customer working in the space, Motability Operations, held their Demo Day to show off what they had built in their four-week residency to their business sponsors. Red Hat’s Open Innovation Labs have been open for just over a year, since it was launched at the Open Stack Summit in Austin and we’ve had a prototype space in Mountain View where we’ve hosted our first residencies as well as hosting residencies in pop-up locations around the world. However, London is our first purpose-built location to open and will soon be followed by a much larger space in Boston and then another in Singapore. Things have been pretty hectic since I (re-)joined in September and it feels like the pace has only gotten faster as we’ve continued to gain momentum and run more residencies with our customers. 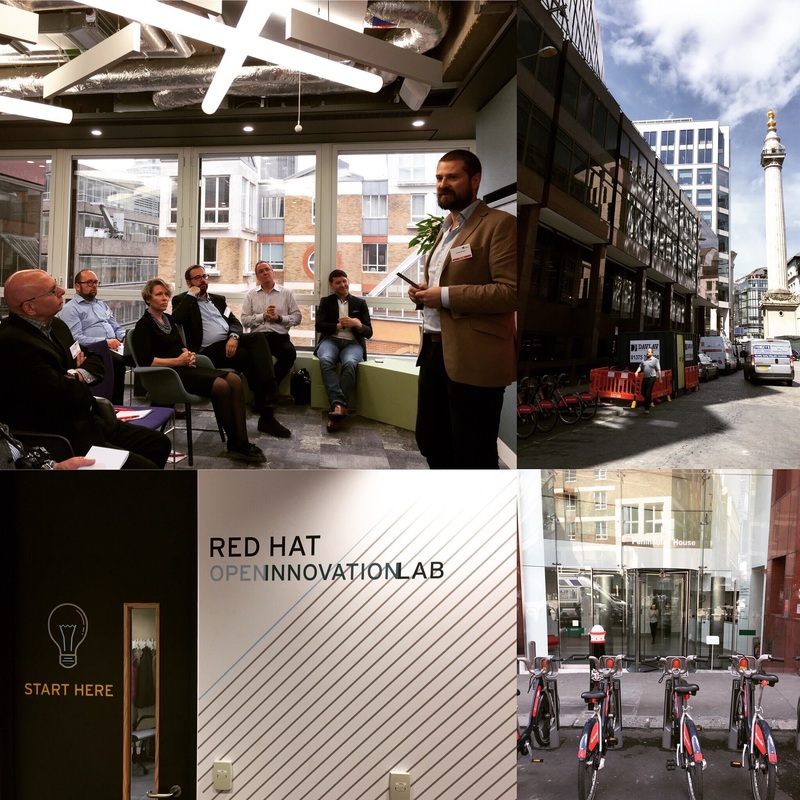 Red Hat Open Innovation Labs opens in London in Telecompaper. We also had some Industry Analysts come along and we actually asked James Governor from RedMonk to speak during our customer launch event, he wrote about his experience here. So what is the Open Innovation Labs then? When we only focus on Technology, even with the best technology, initiatives often fail, so our customers want us to help address People and Process with them. You can think of the Open Innovation Labs as a chemical accelerant or catalyst for the change in the People and Process parts of change which is the hardest part to solve. Labs itself is a paid residency style engagement where we work with a team of 3-6 devs and ops folks from our customer and match them with an equal number of Red Hatters plus a Designer and an Engagement Lead (who acts as an agile coach and works with our customer’s Product Owner). We all work together in one of our dedicated spaces (London, Silicon Valley, Boston or Singapore) or in a pop-up lab (in a cool co-working space in your city with other startups or in their offices). We work on solving real business problems (either creating a new greenfield app from scratch or modernising an existing brownfield one). Residencies are typically 4-12 weeks and culminate in a demo day where we show off what has been built, followed by a retrospective where we transition the application back into your own environment. My short elevator pitch for the Open Innovation Labs is that you can come into our kitchen to write software the open source way, when you leave our kitchen there is no doubt that you will use different tools and equipment and the food you cook (or software) will be very different. You can think of what we have created as a startup incubator or accelerator for our customers - we typically accelerate cultural change and DevOps initiatives in teams from 6 months if you were to do it yourself down to 1-3 months depending on the team and their existing way of working. This is due to our close way of working and the immersive residential aspect of the labs. Open Innovation Labs is primarily focused on providing a strongly opinionated way of working based on the principles of agile, rapid prototyping, design thinking, product focused thinking and DevOps and thus aims to accelerate the People and Process parts of change towards helping our customers become Cloud Native. Demo Part One: How to use a push-button infrastructure in application development - This first demo highlights the open source technologies we use in Open Innovation Labs to accelerate modern application development, and features the push-button infrastructure that supports immediate application development based on our prescriptive infrastructure. And by push button, we mean 60 minutes or less to deploy a fully automated environment. Demo Part Two: How to build and use an automated framework for container-based CI/CD - This second demo demonstrates how the automated framework we use in Open Innovation Labs enables rapid feature deployment, high-quality code and testing standards, and consistent behaviour across environments. Our microsite is a good place to start getting a high-level view of what we do in an Open Innovation Labs residency. We made a video (2min version and 4min version) of one of our customers, Easier AG, going through a residency. This gives you a great taste of just what the residency experience is like. Check out this section of Jim Whitehurst’s keynote video from the Red Hat Summit 2017 in Boston where John Allesio introduced the Open Innovation Labs and where Dorothée and André from Easier AG did a live demo of the two apps they built.